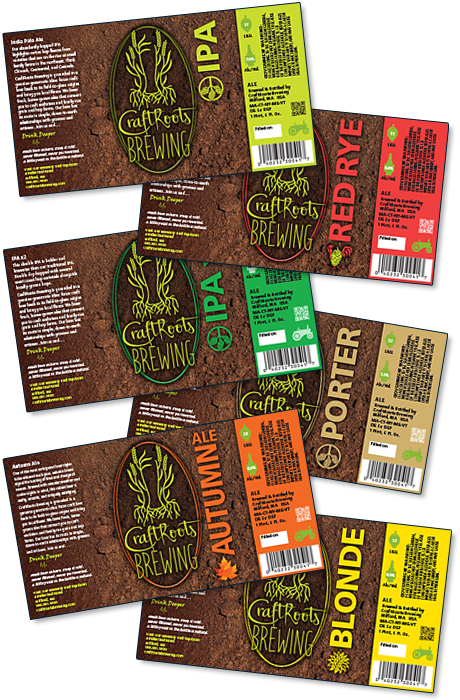 For CraftRoots Brewing we designed a set of bottle labels for their ale varieties. Our goal was to create labels that expressed the CraftRoots vision of bringing craft beer back to its field-to-glass origins. Locally grown ingredients and the concept of a literally “down-to-earth” approach to brewing was made a part of the imagery that went into the label designs. The labels also had to hew to precise government requirements and standards, and be submitted for approval to the TTB. It is a testament to our attention to detail and exacting specifications that the designs were approved on the first submission, no changes required. These tasty brews are now available in exclusive, limited quantities on the shelves at local retail stores as well as on tap at nearby restaurants.